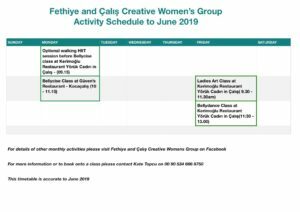 Here at Fethiye Times we love to bring you articles about the many and varied activities there are to do in Fethiye and surrounding areas. Early last year we brought you an article on trekking and climbing. 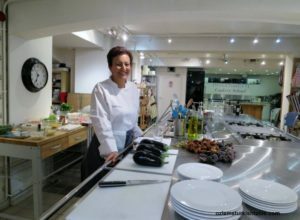 You can click on the link below and have a read if you missed it. 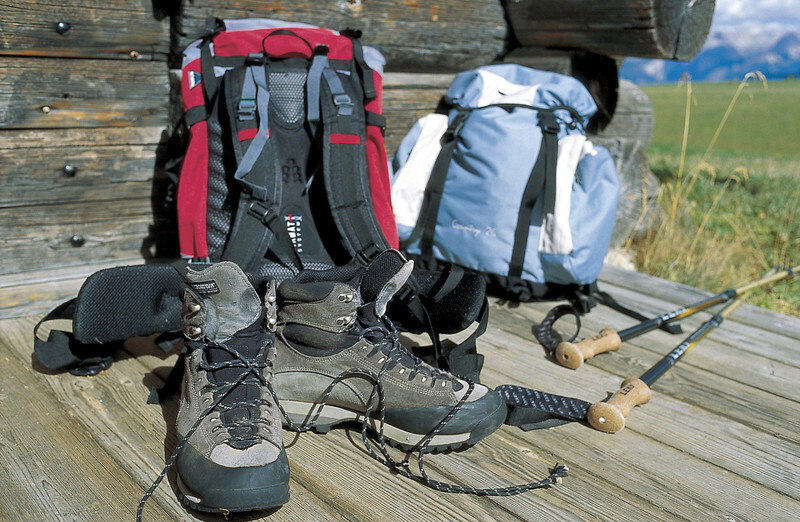 Experienced walkers are well versed in the right equipment for hiking and generally take the necessary precautions to stay safe. Unfortunately that isn’t always the case and local search and rescue teams are called out on a regular basis to “find and rescue” people who are lost, have injured themselves and worse. 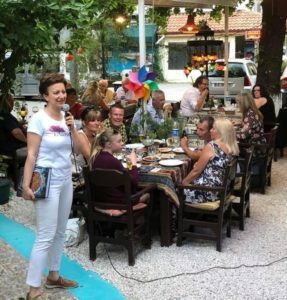 Even experienced walkers can get into difficulties, as happened to three Fethiye residents recently. Thank you to Sian, Carol and Clare for sharing their experience as a warning to others. Sian, Clare and Caro looking happy and relaxed at the beginning of the day – little did they know! 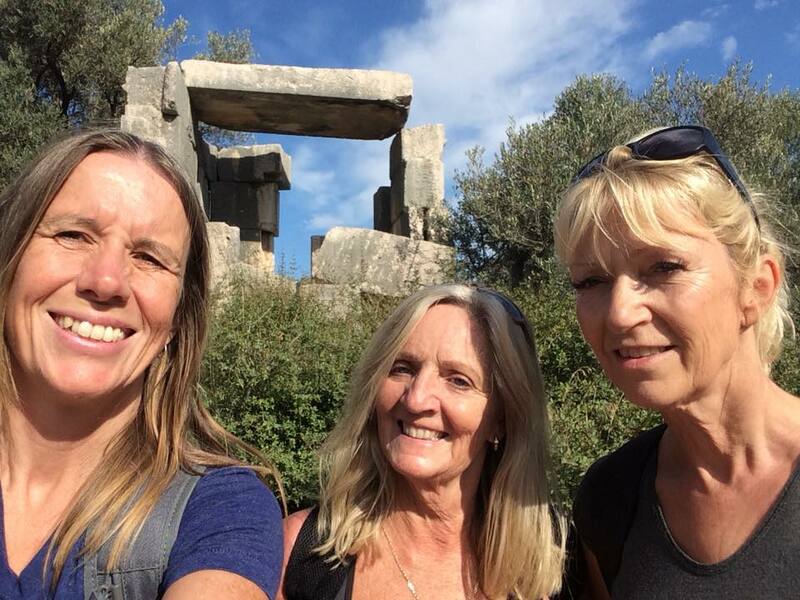 “Myself, Carol & Clare have walked the first five sections of the Lycian Way numerous times in the last year so we felt confident that the Patara to Kalkan leg wouldn’t be a problem. 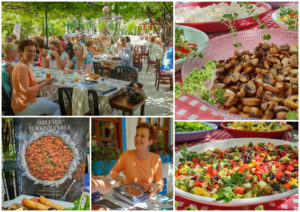 We allocated plenty of time, had the Lycian Way book and map and food and water with us. Early on in the walk we lost the markers and it took us an hour to get back on to the correct path. At this point we still felt that everything was going to be fine but as the walk went on and we got nearer to our destination, the sun started to go down rapidly. We sped up but as this section of the walk was tricky, rocky terrain it soon became clear to us that we weren’t going to reach our destination before dark. 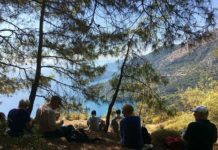 When we could no longer see well enough to look for the Lycian Way markers we contacted Lyn Ward as we knew she was friends with Naim who is involved with local search and rescue. 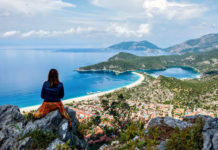 Naim contacted AKUT in Kalkan and within minutes we received a number of phone calls in order to pinpoint our exact location. Once this had been determined we were told not to move as the area we were in was very dangerous. Luckily for us, it only took one hour from the initial contact for AKUT to find us and, during this time we received numerous calls updating us on the situation and checking our welfare. 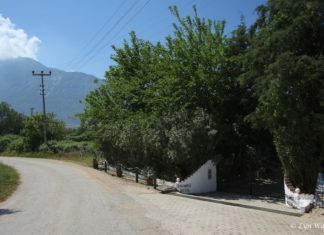 It turns out we were only about 10 minutes away from a track that would have taken us into Kalkan but, as we hadn’t done this section before, we didn’t know this. We are all extremely grateful to Lyn, Naim and our rescuers Fatih and Mark for finding us so quickly. Fatih (pictured) even took us for a çay and organised our taxi back to our homes in Fethiye and Çalış. Plan your route and tell someone where you are going. 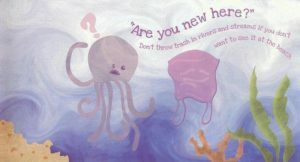 If you decide to make any changes to your route, let someone know. Take a map of the route and a compass for if you stray off the path and lose your bearings. It’s a good idea to check the weather forecast before you leave as it can change quickly in the winter months. Check sunset time too so you don’t accidentally get caught in the dark. If the battery life isn’t great on your phone, invest in a battery pack, charge it and take it with you. Take a torch! So many people rely upon the torch function of a mobile phone which drains the battery. Headlamps are great as they leave your hands free. LED torches are the best type as they tend to be smaller and a lot brighter. Make sure you have plenty of water with you. 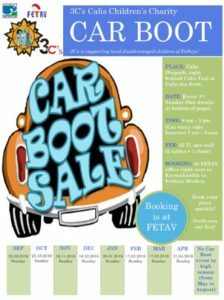 You may have planned stops in cafes along the way but you never know! Take food too, it may be as simple as bread and cheese but make sure you have something with you. Thin layers of lightweight, quick drying clothing. Take a loose shirt to wear in the hotter weather as it is very easy to become painfully sunburned! Thin, anti-odour & quick drying socks. Lightweight, waterproof jacket, warm layers, a hat and gloves for walking in cooler seasons. It may be warm, sunny during the day but temperatures drop very quickly when the sun goes down. 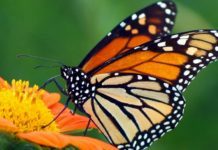 Skin Protection – Insect Repellant, UV protection in small bottles that are easy to carry. 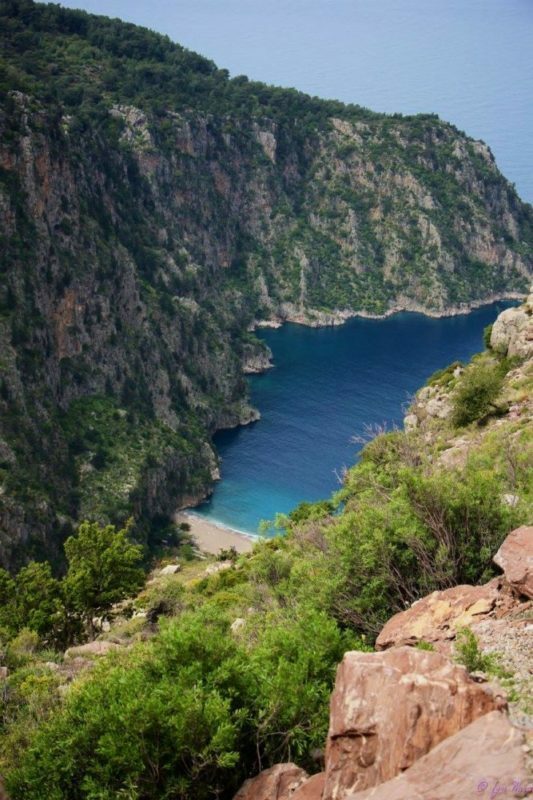 If you are planning a walk around Butterfly Valley in Faralya and decide to clamber down the cliff – DON’T! 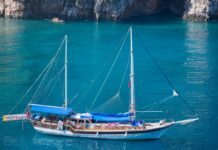 Kelebek Vadısı (Butterfly Valley) at Faralya – beautiful but very unsafe! There were a number of injuries and fatalities last year where people were either climbing up or down the cliffs or standing taking photographs from above and stepping too close to the edge. 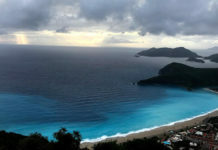 Butterfly Valley is only accessible by boat. 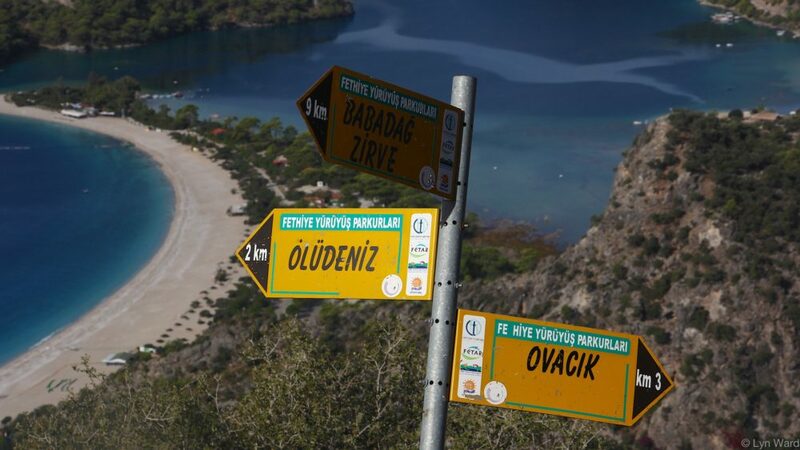 A taxi boat service runs from Ölüdeniz in the summer months for those who want to explore. Search and Rescue services are regularly called out to incidents that are avoidable if the correct precautions are taken. AKUT is a voluntary, non-governmental organization involved in searching, assisting and rescuing all who require help in mountain or other nature-related accidents, natural disasters and all other emergency situations. 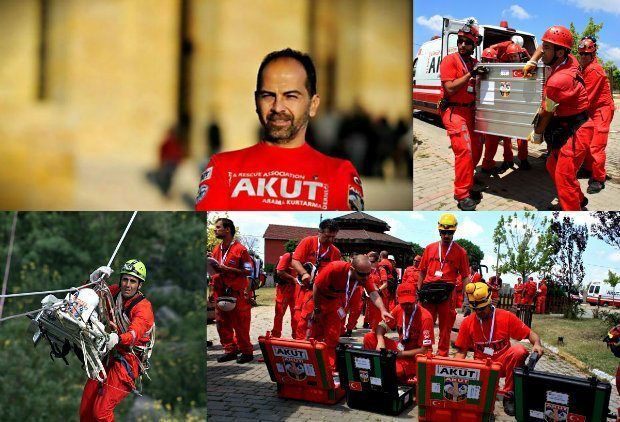 AKUT is the #1 search and rescue organization in Turkey, with the largest number of highly-trained members and the broadest variety of specialized skills. Not only does it have over 200 permanent members and another 2000 volunteer members, it owns state of the art technology that can be mobilized in an instant. AKUT also runs projects to increase search and rescue competency in Turkish society. The local branches across 32 provinces in Turkey are on call 24/7 ensuring AKUT is always standing by. We hope you spend many happy hours hiking and exploring this beautiful part of the world. Enjoy and please stay safe!